This week I lost my best friend, my companion and a very important teacher. She came into my life 17 years ago, a tiny kitten who could snuggle into the palm of my hand. Black, with auburn highlights, she had faint tabby stripes in the summer sunlight that sometimes gave her an aubergine glow. She spoke with a rich vocabulary of tones, and a deep permeating purr that sent love vibrating to the far corners of the room. She taught me to move with grace and to strongly focus my intentions. Her name was Cassandra Bones, but she developed various names throughout her life. 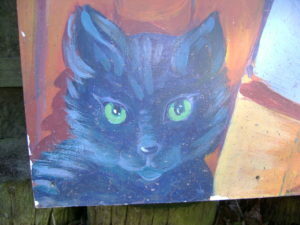 Her dark colour inspired one of her names: New Moon. 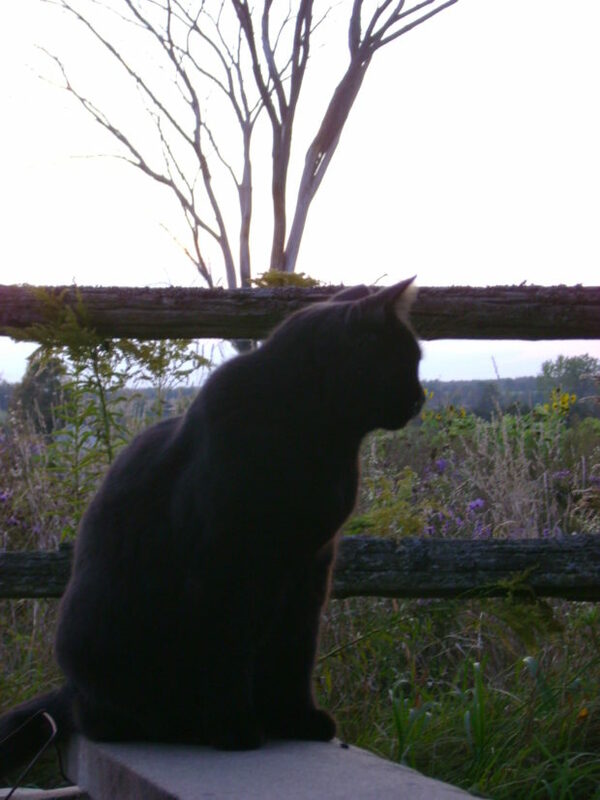 When we moved to our farm, we named it New Moon Farm in her honour. 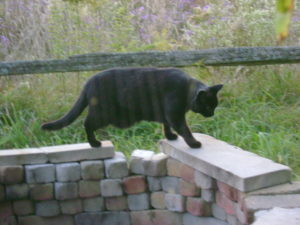 Cass was by my side as I learned the craft of herbalism. She was, it could be said, my familiar. 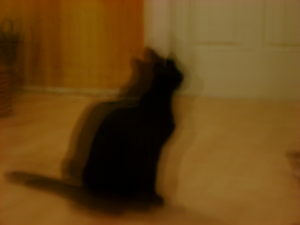 She had a fine ethereal perception, as I believe many cats do. As my knowledge of herbs developed, I noticed that Cass was already quite tuned into which herbs she needed for her own health, and where to find them. One of my favourite stories about her took place in the drought of August 2012. Cass had developed a bladder infection–something to which she was prone. Whenever this happened, I would put together a medicinal tea for her, made of any herbs growing nearby, or that I had on hand, that I knew would soothe and disinfect the bladder. 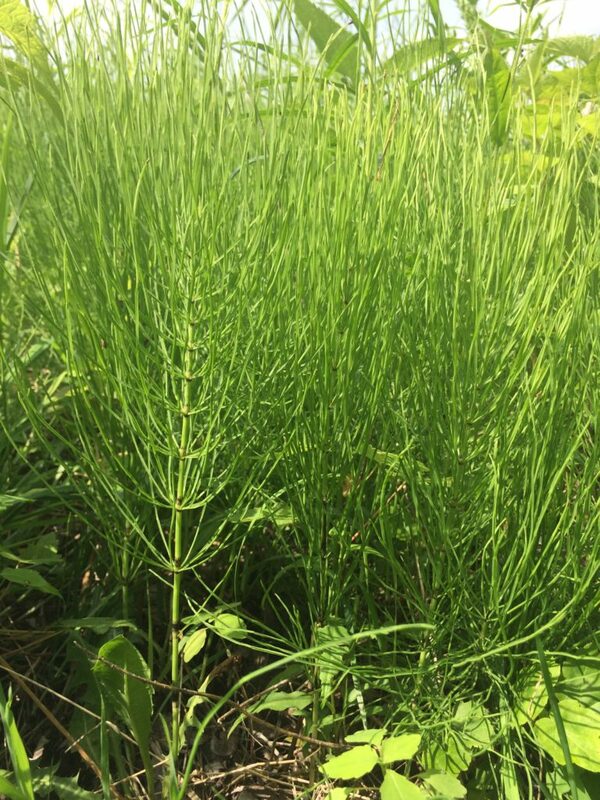 One herb I liked to use was horsetail (Equisetum arvensis)–a really effective anti-inflammatory, anti-microbial and diuretic herb that tones the bladder and strengthens the kidneys. It works just as effectively for humans as it does for cats. This medicine is available for harvest in our area in the late spring, while the ground is still somewhat moist. Its leaves grow upward (vertically) when it’s young, and as the season progresses, they reach outwards (diagonally and horizontally) like a fan. As the plant ages, its silica content increases, making it too tough and abrasive to be used for medicine. So, the rule of thumb is to harvest horsetail in spring, when the leaves are still mainly pointing upwards, not outwards. By August, and particularly during a drought, horsetail is normally growing outwards in its lanky fan-like habit, making it long past its harvest period. On this August day, when I stepped outside, I found what looked like chewed-up grass, left by Cass on the doorstep. She occasionally chewed and spit out grass (as most cats do, especially when feeling under the weather) so this was not unusual. However this particular grass looked a bit odd to me. I examined it more closely, only to find that it was not grass at all, but actually horsetail! Cass had apparently realized that horsetail was what she needed. She had ventured out in the heat, traversing about 10 acres to the horsetail patch beside an underground spring, and bit off some horsetail to chew on! I didn’t know that Cass knew what horsetail was, nor where to find it, let alone that it was what she needed at that time! And she hardly ever travelled such a big distance from the house. 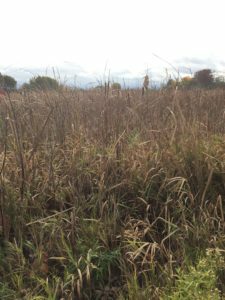 Aside from all this, the horsetail should have been tough and irritating in the mouth, and difficult to harvest at that time of year. Yet she had harvested it. I was compelled to head down to the spring and check it out myself. There I saw with my own eyes, a glowing patch of healthy young horsetail. It was at a perfect stage for harvest! I guessed it must have come up late in the season for some reason, and was being kept alive by the underground spring, despite the drought. Inspired with awe, I snipped a bit of the horsetail for harvest, giving thanks for this miraculous gift. I brought it back to the house and simmered a teaspoon of chopped up horsetail for about 10 minutes in 1/3 cup of water. I then poured that brew over a blend of dandelion leaf, mallow, yarrow and corn silk (about 1 teaspoon of the whole blend), steeping that for about 15 minutes. This created a soothing bladder antiseptic. Once it cooled to room temperature, I gave it to Cass in a dropper (about 10 drops), and continued to give it to her 3 times per day for about a week. Her infection cleared over the next couple days. 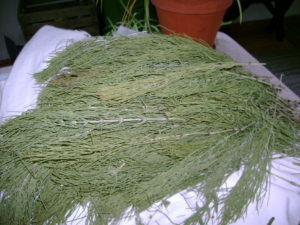 I dried the rest of that horsetail for future use. 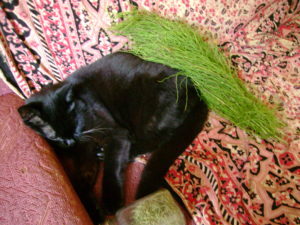 I labeled it “Cass’s Magic Horsetail”–for it truly was magic, just like the cat who had found it! 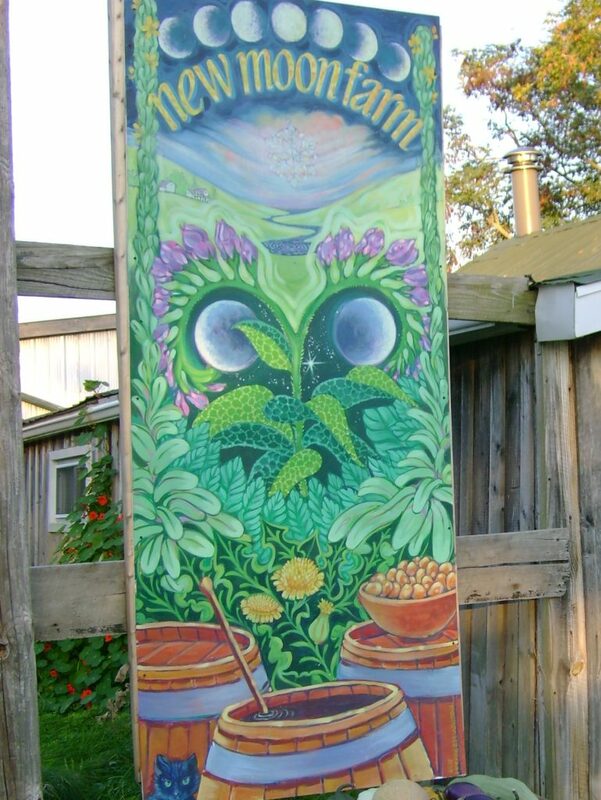 Cass was not only a mysterious knower of herbs, but she was also a giver and receiver of ethereal medicine. Some folks who have visited the Hawthorn Herbals clinic have come to know the sweet comfort of her presence. She often knew just where to place her paw on your body so that it soothed pain or discomfort. She would cuddle beside me and purr when I felt under the weather, staying close by until I began to feel better. She taught me about the potency of healing touch, when given with intention. Later in her life, I would lay my hands on her arthritic hips or her lower back, and I’d sense an easing in her discomfort as I willed her healing with my gentle touch, just as she had taught me. Here, at New Moon Farm we are preparing to sow the seeds of a new season, growing food and medicine to support vitality for another year. As the plants grow, I will remember that sometimes, against all odds, the herb you need is available for you right when you need it–you just have to go and look. I will also remember that ethereal and subtle as it seems, sometimes the best medicine comes with with a focused, loving, healing touch, delivered with presence & grace. For these teachings, as well as all the love and magic, I will always be grateful. So sorry to hear about you Cassandra Bones Tamara. Thank you Marianne. It is a big loss, but I am so grateful to have had her for all these years! Cats are very special friends and the loss we feel when they die remains with us forever. But the memories of their wonderful personalities will always bring a little smile. Rest in Peace, New Moon. Yes, she is definitely still bringing us smiles… Thank you for your words, Helen. That’s a magical tale and filled with lots of love. And now that she’s disembodied she can help you even more just when you need her. 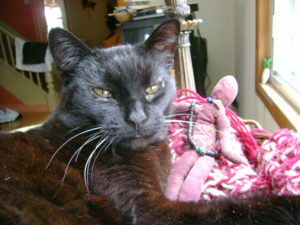 Still, I know you will miss the feel of her fur, the touch of her paw, and the sound of her purring. Ave atque vale, New Moon. Indeed! Spoken by one who truly understands, I believe. Thank you for that.